‘It’s certainly most humbling to be awarded such a high honour by one’s alma mater,’ he said. Goba, a UKZN alumnus, has supported the University’s Engineering initiatives in line with his vision for societal transformation through engineering and education. The renowned businessman and entrepreneur grew up in a Durban township during apartheid. In 1975, before going to university he visited a company, Keeve Steyn and Partners (KS&P), which encouraged him to consider studying Engineering. This visit conceived a dream that led to his graduation in 1979 and the subsequent establishment of his own consulting engineering company. After matric, Goba studied at Mmadikoti College in Polokwane (then the only technikon for Black people in South Africa) where he completed a diploma as a survey technician. 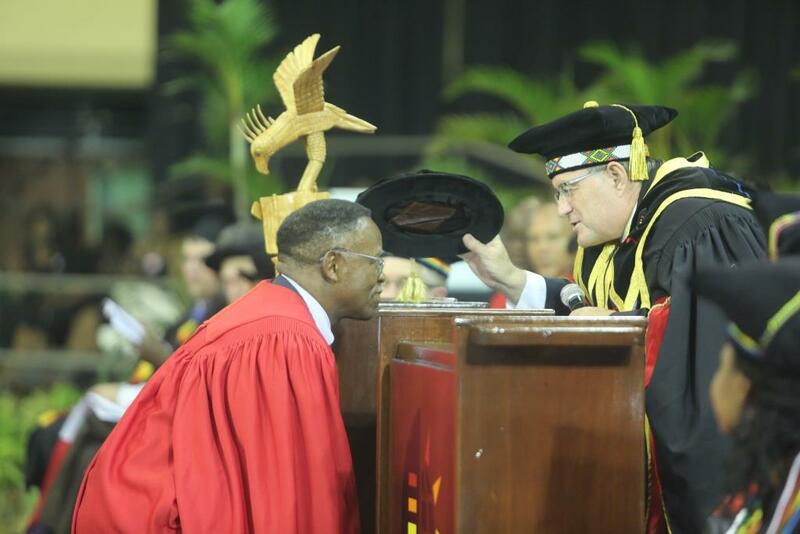 This earned him a prospect to apply to university, and with assistance from the then-University of Natal (UN), obtained permission from the Minister of Higher Education to enrol for a Bachelor of Science in Civil Engineering degree at UN in 1976. He completed his degree in 1979, making headlines across the segregated country, and then joined KS&P. He registered as a professional Engineer, went on to complete a Masters in Engineering at Cornell University in 1986 and then worked further in Maryland in the United States. Returning to South Africa, Goba partnered with his friend Ebenezer Moahloli to found Goba Moahloli and Associates Inc. (GMA) in 1993 in Johannesburg and the Eastern Cape, with offices later in Durban and Cape Town. GMA merged with KS&P to form Goba (Pty) Ltd, and the company took on several projects in the region, growing to a staff complement of 500. In 2013, it merged into Hatch Africa (part of a global multi-disciplinary group of over 10 000 staff), and now operates across the African continent and in Europe. Goba (Pty) Ltd projects included road works at the Umgeni interchange in Durban, the King Shaka International Airport, the widening of the Durban harbour entrance and subsequent relocation of the Sewage Pump Station for eThekwini. In Johannesburg, the company worked on Gauteng freeway upgrades prior to 2010, the Nelson Mandela Signature Bridge, the Berg River Dam in the Western Cape, and various infrastructure and services projects in the Eastern Cape. Goba’s accolades include a SAICE Gold Medal, a Lifetime Achievement Award for Excellence in Engineering from the South African Professional Services Awards (SAPSA), and honorary doctorates from Stellenbosch University and McMaster University in Canada. Goba is a former president of the South African Institution of Civil Engineering, and is president of the Engineering Council of South Africa and the South African Academy of Engineering. Having benefited from various training opportunities and experience, Goba advocates for these to be priorities for young people embarking on a career of their choice and hoping to be part of building successful enterprises of the future. He has proved to be an inspiration for up-and-coming entrepreneurs, encouraging them to learn constantly.